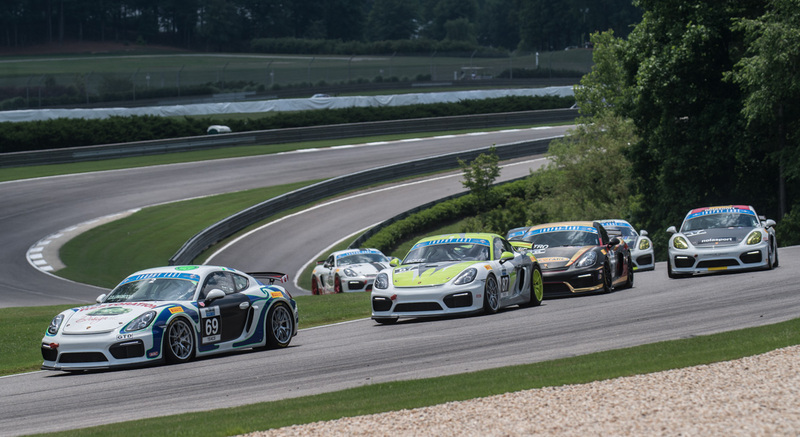 The Porsche Club of America (PCA) Club Racing Trophy East Series competed in the series’ second event over the weekend at scenic Barber Motorsports Park. Competitors received points based on finish in each of the four classes – TE4CS (Cayman GT4 Clubsport entries), TE4CSM (Cayman GT4 Clubsport Masters), TE6 (991 GT3 Cup entries), and TE6M (991 GT3 Cup Masters). During Saturday morning’s 30-minute Sprint 1, Curt Swearingin, representing the Tennessee PCA Region in his No. 1 TE6 entry, won the race in the TE6 class and overall with the fastest lap time of 1:29.981. Swearingin’s ACI Motorsports teammate Richard Edge came in second with Hairy Dog Garage’s John Goetz placing third in his No. 57 TE6 entry. In the TE4CS class, series veteran Tom Collingwood came in first place in class and fifth overall in his No. 69 BGB Motorsports entry. NOLAsport driver Mike Vess, who filled in for series veteran Alejandro Galindo in his No. 17 entry, came in second and ACI Motorsports’ David Hurt rounded out the TE4CS podium in third. This marked Collingwood’s first series win. In the TE4CS Masters class, Vess’s NOLAsport teammate John Crosby came in first and Autometrics Motorsports’ Charlie Craig coming in second. In Saturday afternoon’s Sprint 2, Swearingin once again led the race and came in first place in the TE6 class and overall. Edge and Goetz repeated their 2-3 finish in the TE6 class. In the TE6M class, Pierce Racing Development’s Gary Jensen came in first place in class and fourth place overall. This marked Jensen’s first podium of the weekend. Collingwood was on a roll and once again won the TE4CS class with ACI Motorsports’ Efrin Castro coming in second and Vess placing third. In the TE4CS Masters class, NOLAsport’s Crosby came in first with Craig, representing the Connecticut Valley PCA Region, coming in second. PCA Trophy East competitors finished off the weekend with an 80-minute endurance race Sunday afternoon at Barber Motorsports Park. Swearingin, Edge and Goetz repeated their 1-2-3 finish in the TE6 class with Finch placing first and Jensen second in the TE6M class. In the TE4CS class, Vess won first with Castro placing second and BGB Motorsports’ father and daughter duo – Bruce and Sydney McKee – placing third at their home track. Overall event winners included: Swearingin, Edge and Goetz in the TE6 class respectively, Jensen and TOPP Racing’s Ken Finch in the TE6M class respectively, Castro, Vess and Collingwood in the TE4CS class respectively and Crosby and Craig in the TE4CSM class respectively. Next up, the PCA Trophy East Series will head to VIRginia International Raceway for the third year in a row. The event weekend kicks off June 22-24 in Alton, Virginia.